It’s been a couple of millennia since people packed Roman coliseums to witness the spectacle of racing. The appeal of the sport hasn’t dwindled since that time, though it is far less barbaric than those ancient competitions. Chariot racers of the Roman age would scoff at the comparatively tame demeanor of today’s challengers. Victory Point Games’ upcoming Kickstarter, Chariots of Rome, promises to combine the thrill of racing with the brutality of combat. Your goal is simple: win the race. However, accomplishing this is not that easy. Racers have a multitude of things to consider just to compete. Every player has to monitor their horses’ endurance, their own mental exertion (known as rattled in game), and tactical options. To complicate matters, opposing players can thwart you through positioning or outright attacking. Even the basic two-lap race can be fairly grueling. You begin by drawing a charioteer card, which helps give your racer some individuality. Each charioteer has a special ability that can be used throughout the game. After that, you join a faction, which is mostly for flavor but does determine which color of chariot you’ll be commanding. Everyone begins with the same amount of endurance and tactics, the latter being used to either avoid or dish out ruthlessness. Initiative cards are used to determine player order every turn and also to decide starting position in setup. You’ll be shuffling these often, as turns are fairly quick affairs. With a limited number of factions, it is possible luck could allow one player to gain the first move consecutively, but, as you’ll read, Victory Point adds in some balancing mechanisms to offset this. Your faction card holds all the information you’ll need to control your chariot. There’s a number grid to keep your endurance, tactics, and rattled levels. Each turn, you’ll need to decide how fast you want your chariot to go. There are three speeds: four, seven, and ten, which represent the number of spaces you’ll move that turn. Everyone is on the slowest speed, four, on the first move as your chariots begin the race. While plodding, this speed does allow you to regain one endurance and tactic while also removing two rattled levels. The moderate seven speed still lowers your rattled level by one, since you are still in control of your reign, while the top speed of ten can really distance you from the pack. The downside to going all out is that your horses tire faster, and you’ll lose one endurance for the sake of speed. Deciding your speed is your first decision each turn. You can increase your speed by one level, though some charioteer cards alter this, or you can decrease it by any amount. Furthermore, you can alter the standard four, seven, ten movement allowance by using one of your available tactics or endurance levels to chivvy your horses to coax extra movement from them. A three-sided die with Roman numerals I, II, and III is rolled to dictate how much to add to your base movement. Initially, you and your fellow participants play nice, moving down the first straightaway and jockeying for position within one of the many lanes of the track. Approaching your first turn is where you get your earliest challenge. You’ll be tempted to go at your top speed early to gain the advantage, but entering a corner faster than you should can have some disastrous effects. Each lane of a turn has a Roman numeral on it. The inside lane is labeled a IV all the way up to the outside lane’s IX rating. To determine the danger of your turn, you add your current speed and rattled level together. The difference between this and the rating of the corner lane is the number of action cards you’ll draw. Action cards are used to see how a certain event affects you. They are divided into four sections: whip, ram, corner, and danger. You look at the section corresponding to the threat you are dealing with, and the more cards you draw, the more your chariot could be affected. You can reduce the number of cards you draw by using your tactics on a one-for-one trade. When you draw, you may get lucky and draw a no effect. You are more likely, though, to lose endurance or tactics or to become more rattled. Additionally, a dangerous curve could also cause your chariot to swerve, which is both one of the most enjoyable and chaotic parts of the game. On a corner, a swerve causes your chariot to move diagonally backwards into the next outside lane. Alone, a swerve does little more than cost you a space movement, but they can cause you to careen into another player or even into the wall. This results in a crash, which is resolved in the danger section of another action card draw. The chain reaction of a swerve can be devastating to several racers. As you come out of the first turn, the game’s other options are now available to you. The first player of the turn gets to roll the fate die, which can give the player a boost in endurance or tactics or remove a player’s rattled state. The die can also allow the drawing of a fate card, which will typically give the driver a bonus for that turn, though some are detrimental. Overall, the fate die is a balancing mechanism, since the first player can become a target of players moving later in the round. Conversely, the advantage of being the first player to enter a turn is offset by giving every subsequent player entering that turn a tactics bonus. These bonuses are subtle, but a nice addition to the game. Exiting the first turn also allows players to attack each other. As you move, you can choose to ram or whip players as you come alongside of them by spending a tactic. Three action cards are then drawn, and the corresponding whip or ram section on each determines what happens to the opposing player. Whip attacks are generally weak and cause little damage to your opponent, but they are also safer to the attacker. Ram attacks can cause greater damage, but since the attacker must also draw one action card, the attack could backfire and cause the attacker to swerve. Defenders can limit the damage by using their own tactics to reduce the number of action cards they must draw, all the way down to zero. Generally, the reward of attacking is greater than the risk, but it does cause you to pay attention to the positioning of chariots on the track. Speaking of positioning, its importance also increases after the first corner. Once a player determines his speed and any movement bonuses, they must use all of their movement if possible. Typically, you want to find the clearest path to complete your move, but sometimes a pack of chariots, or even the debris of wrecked chariots, prevents this. You must attempt to overtake your obstacles to finish movement. For every space you move through an obstacle, you must draw an action card and check the danger result. Weaving your way through the crowd can really put your own chariot in danger. If a path through the obstacles is impossible, your chariot stops short at the cost of an endurance or tactic. Your ability to manage your resources will ultimately decide your success in the race. Playtesting an aggressive tactic saw the earlier leader succumb to vicious attacks without tactics to ward off their effects. A plodding strategy left another chariot woefully behind. The game is fairly easy to learn, but there’s a deep level of strategy here. How do you approach a turn? When do you go for the attack? How do you position yourself in the race? Every turn presents a challenge. The game can have two to four players that can play with either one or two charioteers each. The more chariots in the race, the better the game becomes as positioning and the chain effects of attacking and cornering play a bigger role. Though the components of the prototype will assuredly improve, the game is fleshed out well. Chariots of Rome will be worth looking for when it hits Kickstarter on April 18. 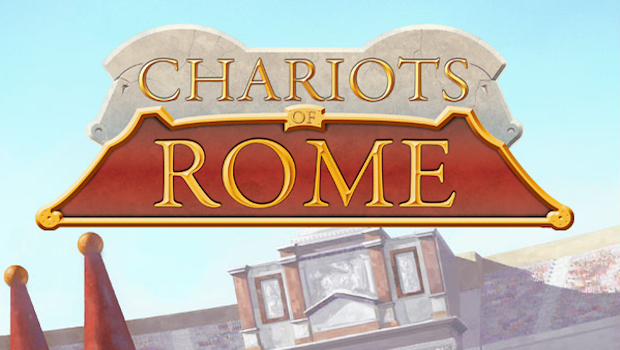 Chariots of Rome recreates the frantic and brutal nature of a chaotic chariot race. You take on the role of a Roman chariot racer battling against opponents who will do whatever it takes to defeat you. Managing both your horses' endurance and your own mettle are crucial to surviving to the finish line, as the game forces you to time your risks appropriately. Push too hard for speed, and you may run out of steam short of victory. Play too cautiously to conserve health, and you will find yourself well behind the pack. Maneuvering through the crowd is difficult enough, but the game takes a deliciously nasty turn with the ability to attack your fellow racers. Whipping and ramming your opponents can cause damage or even swerve your opponent off course. Yet, even attacks can backfire, causing you to lose valuable ground or health. Chariots of Rome is all about risk versus reward, and it works brilliantly.